Eagle Superabrasives, Inc. offers CBN wheels in three different bond systems. CBN is used to grind Ferrous materials with a hardness greater than 42 Rc. Used in the manufacture of D2,M2, Alloy and Super Alloy End Mills, Drills and Reamers. Our unique bond systems, comprised of a mixture of specially selected alloys, ceramics and diamond powders and coatings all sintered in environmental controlled furnaces, offer stock removal rates and tool edge retention that were unheard of only a few years ago. Hybrid bonds have now become the industry standard bond type for all manufacturing of Ferrous based steel end mills, drills and reamers. Vitrified bond CBN wheels are typically selected for grinding Camshafts and Crankshafts, internal and external grinding of cylinders, etc. 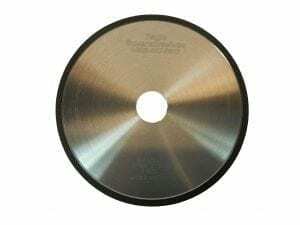 Vitrified bond wheels are extremely aggressive and free cutting and provide excellent tool life. They require less dressing and offer longer truing intervals than resin bond wheels. They are cool cutting and are suitable for “lights out” high production grinding in manufacturing environments.